Focal atrichia is the condition of no hair in some areas of scalp and this condition is generally related with androgenetic alopecia. In this condition, small circular area of pencil eraser areas are seen devoid of hair and biopsies of these areas show accumulation of tiny vellus hairs. Studies have demonstrated focal atrichia as common condition in androgenetic alopecia than other types of hair loss disorders. According to this study conducted in 2017 by Olsen and colleagues FA was seen in 44% patients as compared to 2% of other diseases as a reason for hair loss. Even this study claimed that 67% of women were suffering from hair loss due to FA. This study was conducted to evaluate the frequency of FA in various types of hair loss conditions and its characteristics especially in female androgenetic alopecia. Under this study, 250 consecutive female patients with hair loss has been examined for the presence of FA. During the studies 44% of females were having female pattern hair loss out of which 15% were having early onset and 67% were having late onset however remaining 2% were having other hair loss problems. This study claimed that focal atrichia in female pattern hair loss shows more progressive miniaturization process than the other areas of scalp. This study claimed that focal atrichia is associated with some severe diseases of long term and this study was odd with Olsen study. Even the study conducted by Zhang also shows the same findings. 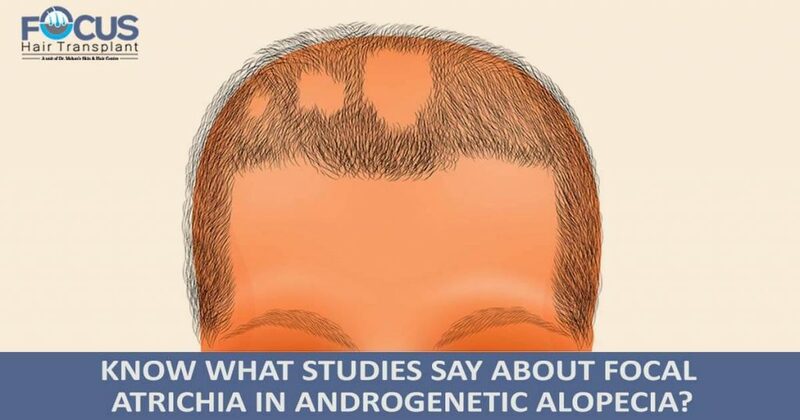 HU conducted case control observational study to find out the triscopic findings of androgenetic alopecia so he conducted the study with 750 males and 200 females patients of pattern hair loss along with 100 male and 50 females of normal control. He claimed relation of focal atrichia with severity of hair loss as finding of study. Zhang and his colleagues conducted study to analyze the characteristics and associated triscopic features of female pattern hair loss with 60 patients of same disorder. He claimed that there is positive correlation between focal atrichia and stage of hair loss. Each study claimed that focal atrichia is commonly seen condition of androgenetic alopecia however severity can differ.